Today, I am lucky. I have got my abstract approved by Dr. My next step is to submit it for review in the coming faculty meeting. 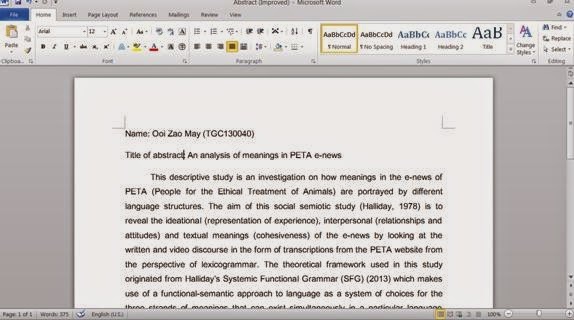 I am not able to squelch my excitement as this research is an analysis of meanings in PETA (People for the Ethical Treatment of Animals) e-news!!! PETA is an organization I have idolized for so long. Well, I am a flexitarian. An animal lover. 90% of my daily meals = vegetarian. My dream is to be a vegan. Below is my abstract to be submitted. It took me two drafts before I reached this best version that made Dr. satisfied. FYI, my Dr. is a vegan. How coincident it is! My research is about SFL and she is the only SFL expert in Universiti Malaya. She let me try her vegan homemade fruit cake just now. I felt the warmth of her heart from the cake. Another good news. FYI, I am applying for a part-time job. Today, one college replied me. He wanted to hire me! However, I have turned down the offer due to some personal reasons. Erm….but it feels good getting know that you are wanted in the working world. The difficult working world… I am honoured.